It is no longer news that pro-Biafra activists are being murdered unlawfully, they are incarcerated and forced to disappear. In most cases, after the forceful disappearance; they are found as corpse' in a secret mass grave or nearby bush. The revealed or exposed cases showed their hands were often tied backwards. When they are not seen in mass grave or elsewhere as corpse, they are seen in different prisons suffering one injury or another that will later lead to their death. The question remains, why murdering peaceful Biafrans with such magnitude of aggression? The bottom line remains that, whether you like Biafra or not, whether you agree with them or not, Biafra activists are lawful and peaceful, they have committed no crime to warrant such unlawful confrontations. They have not killed, raised a stick or shown any hatred but have only asked for Biafra within the confines of law. Self-determination is not a crime neither is it treason, if what they are doing is lawful then Western Sahara shouldn't have received Nigeria's pat and financial support, Palestine should not have been sponsored with tax payers money. The Nigerian forces and her commander in chief should be ashamed of themselves, killing defenseless Biafra activists and supporting armed Palestine activists. By killing or stopping every peaceful approach or campaign for the restoration of Biafra while millions of Biafra agitators remain resolute and have neither shown any sign of relenting or surrendering; what does Nigerian government hope or plan to achieve? Are they telling Biafrans that peace is not acceptable and have no room in Nigeria? Are they telling Biafrans that the fundamental right to agitate within the confines or limitations of law is unattainable or denied of them? Is Biafra banned or illegal indigenous land, is the existence of Biafrans or Biafra in Nigeria unacceptable? If this is the case of which they are being killed, incarcerated and forced to disappear, then Biafra is undeniable, so they can live and enjoy fundamental rights that define human being. Muhammadu Buhari believes that his Nigeria will crush Biafra and everything therein. 1967 is a good experience to building on, he must as well have taken home some assurances from Saudi King and other Islamic leaders. OIC must have given him backing that Christian-Biafra will be wiped out the second time. As the Hitler of Africa is advancing his course, it is important to let him know that God does not sleep nor aid the unjust even though the world deserted His children. Unlike the class of 1967 that suffered blunt genocide, this class is suffering another but cold genocide for no apparent reason. Unlike 1967 that is physically and mightily based, this class is intellectually and peacefully based. This class has not killed or beaten anyone but they have been killed and approached with crimes against humanity. In the face of this, this class has shown perseverance and for this, humanitarian assistance is needed to curbing this genocide. Everywhere in the world, referendum has always been the solution and if Nigeria is part of the world, referendum must be humanitarianly invoked. There seems to be a repeat of conspiracy of silence while blood flow and human beings disappear. The relevant world governing bodies have neither condemned such barbaric act. They have all gone mute; they have labeled genocide on Biafra “internal affair". Biafrans are species of terror and they have sufficiently killed and maimed them. Muhammadu Buhari, He is hell bent in killing peace and civilized activists and lawful campaign. He is slaughtering Biafrans anywhere they are seen. He doesn't want to see existence of Biafra and anything associated with it. He vehemently attack and murder anything that reminds or ask or bear Biafra. This includes murdering a school child or anything from Biafra or with Biafra inscriptions. Muhammadu Buhari is on the rise and flying oddly because he has not been checked by relevant authorities. This coupled with religious fanaticism has made Nigerian government a monster that feasts on Biafra. You might not know this monster but Biafrans can tell you more by virtue of experience of what they have passed through. In the quest of killing peaceful Biafra and Biafrans, Soldiers were ordered to shoot mercilessly at Biafrans in Aba. 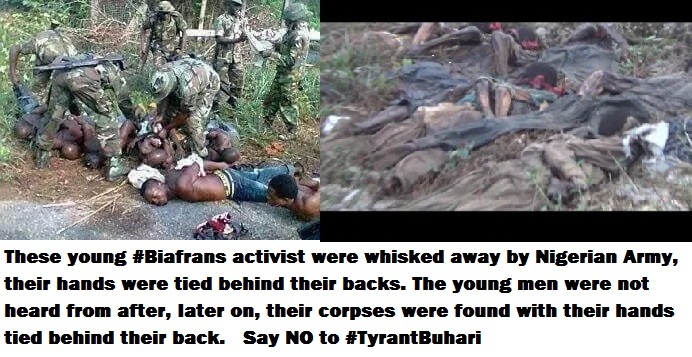 Biafrans going to burial were stopped and maimed, tortured and arrested, the arrest which later resulted to inhumane murder being circulated online today. All lawful newspapers containing Biafra news were seized and vendors harassed. This is spilling beyond control because the perpetrator is not being checked. Finally, if Western Sahara and Palestine can receive a boast for self-determination from Buhari will he kill Biafra and her activists? This has really gone beyond politics but religiously inclined development. By virtue of his support for Muslims and hatred for Christian-Biafra; this is becoming an unjust, ethnic and religious battle that must be checked before innocent people suffer another war of aggression. I'm pained that we have no defense mechanism but talk which is cheap while exposing our youths to cheap death.We must establish underground resistance movements to make govt people pay for murder of our youths by doing what we ought to do. This is black Africa the West listens only to violence , resources in exchange to arms or mercenaries. They can rule in the day and we operate at night, this will make them offer negotiation.